Imagine the humidity, the dense soil beneath your feet, the lush canopy above that lets the sun’s light peak through in shards that dazzle; imagine the cries of macaws and apes and insects; and imagine pushing through the foliage to encounter a person who you’ve never seen before and who’s never seen you. Or anyone like you. That’s first contact. Imagine the tube, the traffic and the commuters, the drone of buses, the checking of directions on your phone; imagine pushing open the door to the rehearsal room to encounter your fellow cast mates who you might have seen before in a show and maybe they know a friend of yours… It’s a sort of first contact. It’s not as unique as proper first contact but it’s a hint we can take to imagine the real thing. It’s the first day of rehearsal and people are meeting for the first time. 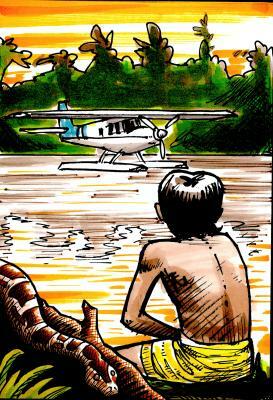 Don’t Sleep There Are Snakes is set in the Amazon. It’s the true story of a missionary and linguist sent to convert a tribe whose language no one had ever learnt. And as he immerses himself in their language and culture he discovers things about them that have devastating consequences. We’re thrilled to have assembled a talented ensemble: Dan, the linguist and missionary, is played by Mark Arends, who starred in the Almeida’s recent production of 1984. He’s joined by a Japanese actress called Yuriri Naka, Clifford Samuel, who for the last year has been touring in the critically acclaimed David Greig play The Events and an American actress called Rachel Handshaw. The cast is completed by founding simple8 members Christopher Doyle and Emily Pennant Rea. From their first contact with each other they’re going to spend nine weeks together working out how to represent a tribe few have ever met and how to speak a language few have ever spoken. Like an Amazonian explorer it should be exciting, foolhardy, fun and challenging. The results can be seen pretty soon with a ticket offer for the first week – £15 available for every performance up to Easter when you quote “SIMPLE8”. We hope to see you there, first encounter or not. rehearsal shots and interviews with the cast and creative team. and only pay £15 for all tickets. when making your booking online. Book now people – I said book – BOOK! boooooooooooooooZzzzzzz – ok fine wait – no only kidding BOOK! We’re ready – are you? There are still some £5 tickets up for grabs. Get them while you can and join us as the results of the General Election unfold. Book HERE! Get your tickets now – FOR ONLY £5 – by booking through the Arcola Theatre HERE and join the debate during the election. Rehearsals will begin this week, so stay tuned for more details. 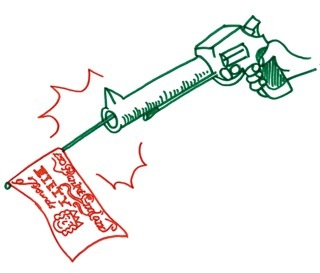 Back after an extended period of development, we’re delighted to announce our new show – THE TEXAS SHARPSHOOTER – is coming to Arcola Theatre in May 2015. A new improvised show about financial crisis – and staged on Election Night 7th May, running for only 3 nights – we’ll be covereing the results of the election as they occur… in our own way. Tickets are a steal at only £5 – and on sale very soon – so come on down and join the debate. More details HERE. We’re very excited to annouce that at the end of the two week workshop we’re about to embark on we’ll be showing some of the fruits of our labours in a free workshop performance on Friday the 31st of October. You can find all the details of the work and how to reserve tickets here and we’d love to see as many of you who can make it along. We’ll see you on the 31st! It’s been a long time but Simple8 are finally back in the room. We’ll be embarking on a two week R&D of two potential new projects at the end of October. If the ideas bear fruit we’ll start talking about them in a real sense but for now it’s all very exploratory and experimental. Please don’t misread the title of this blog post as any kind of cryptic hint that we’re adapting Sister Act. We’re not, although that would be amazing. Hello everyone. 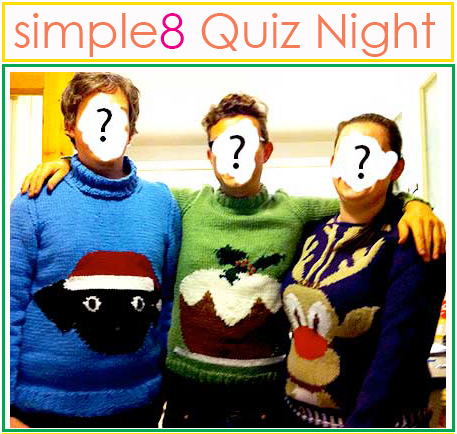 Christmas is fast approaching which means, of course, it’s time to put together a team and get down to the Simple8 quiz to show off your knowledge chops. This year we’re being hosted by the very lovely people at Shoreditch Town Hall on the 17th of December. Entry is £10 and all proceeds go towards the next Simple8 season. We’ll be kicking off at about 7.30 and it promises to be a brilliant evening. We hope to see you there!